Graeme McDowell is a professional golfer from Northern Ireland who plays on both the PGA Tour and European Tour. He is well known for winning the 2010 U.S. Open at Pebble Beach, where he ended a 40-year drought for Europeans at the tournament. McDowell has won ten events on the European Tour, and three on the PGA Tour. He has also represented Ireland at the World Cup and been a member of the European Ryder Cup team on four occasions. He has appeared in the top-10 in the Official World Golf Ranking and his best ranking position is 4th. 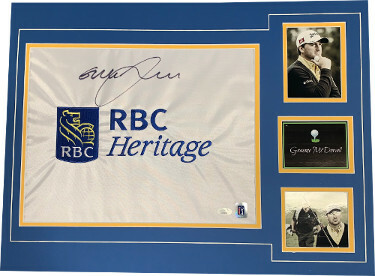 Graeme McDowell has hand signed this RBC Heritage White PGA Tour Embroidered Pin Flag Matted with Photos as shown to approx overall size 18x24. JSA Hologram #DD39372 and Certificate of Authenticity.